Memphis 901 FC caps off its three-match road trip this weekend against North Carolina FC. The match is set for 6 p.m. CT on Saturday inside Sahlen’s Stadium at WakeMed Soccer Park in Cary, North Carolina. Memphis should hold their collective heads head high coming into Saturday’s match, despite suffering a 2-3 defeat in last week’s match at New York Red Bulls II. The club proved something to the league: Whether on the road or at home, Memphis 901 FC is a difficult team to beat. North Carolina FC holds a 2-0-1 record with wins over Louisville City FC and Bethlehem Steel FC. The team failed to accrue all three points in last week’s 1-1 home draw against the Charleston Battery. North Carolina easily won their opening match of the season with a 4-1 win over Louisville City despite having 40 percent possession. Netherlands-born Marios Lomis scored the first goal of the season and nearly produced a hat trick, but he hit the post on two occasions. The 6-foot-2 inch target-man is NC’s main striker and has two goals in three matches played. The following week, Lomis atoned after failing to score from the penalty spot and scored the match-winning goal against Bethlehem. North Carolina does not need to dominate possession in order to win. The club possesses a potent counter attack, spearheaded by Lomis and Ben Speas. Speas, on a season-long loan from Indy Eleven, is NC’s number 10 and is one of the better facilitators on the roster. The 28-year-old attacking-midfielder was a standout college player for the North Carolina Tar Heels. Speas, through three matches played, played 12 key passes, recorded one assist and boasts a passing success rate of 78 percent. North Carolina FC plays with a 4-4-1-1 formation and Speas plays underneath Lomis. Memphis has one win through the first four matches of the season, but the team is starting to find a rhythm. The club’s chemistry was evident in last week’s five-goal thriller of a loss to NY Red Bulls II. Playmaker Adem Najem scored the opening goal 11 minutes into the match, as Memphis possessed the majority of momentum early in the match. The stout 901 FC backline conceded three goals but did not make it easy for the Red Bull’s attack. Memphis managed 27 interceptions, 23 clearances, 14 tackles and a tackling success rate of 50 percent. The 901 FC attack pestered the Red Bulls defense for 90 minutes and nearly tied the match in the second half. The Memphis forwards ended the match with two goals, 13 shots and five shots on target. The holding midfield duo of Dan Metzger and Ewan Grandison is proving to be one of the better partnerships across the USL Championship. The pair harassed the NY midfield all match and will look to continue their form against North Carolina FC. The 901 FC captain, Marc Burch proved his worth in last week’s loss. The defender was vocal for 90 minutes and rarely made a mistake on the defensive end. 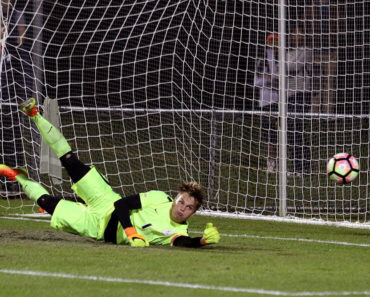 He nearly netted a brace, but NY’s goalkeeper, Evan Louro, made a miraculous diving save to deny the veteran’s initial free kick attempt. Burch scored the second goal for Memphis with an expertly placed, powerful free kick. The match is set for 6 p.m. CT, Saturday, April 6 inside Sahlen’s Stadium at WakeMed Soccer Park in Cary, North Carolina. You can watch the match on ESPN+ nationwide or locally on CW30. 901 FC’s next match is at AutoZone Park on April 10, against Atlanta FC II. That match will be televised on ESPNnews, so we need to have a strong showing of support on national TV.